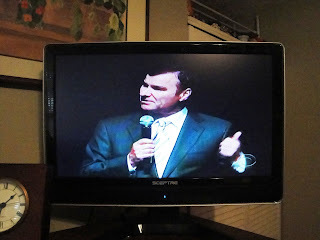 Robin and I have been to Houston and back. A little battle worn; but, we had a great time. 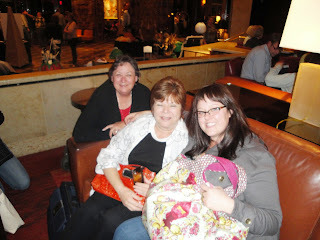 We went to Quilt Market and shopped till we dropped. I'll tell you about the quilts another day. But I want to tell you about a couple of fun things. 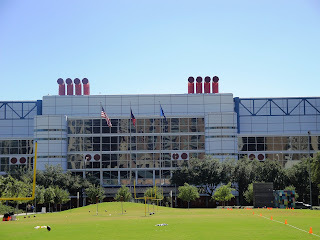 Here is the Convention Center. Isn't it impressive? And yes, it looks just like a big ol cruise ship. Market really gets started on Friday night with Sample Spree (sorry no pictures of crazy quilters shopping like mad ). 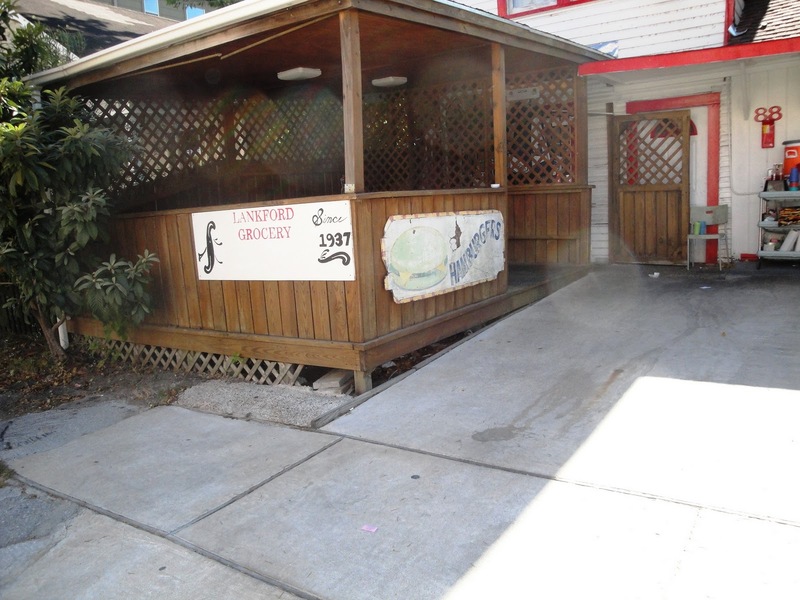 So for lunch we found one of Guy Fieri's Diners, Drive-ins and Dives joints called Lankford Grocery and Market. Great burgers and onion rings in an absolutely charming location since 1937. And we had some fun hanging with great quilters and fabric designers like Tula of Tula Pink. What a delightful young woman. See that great bag. 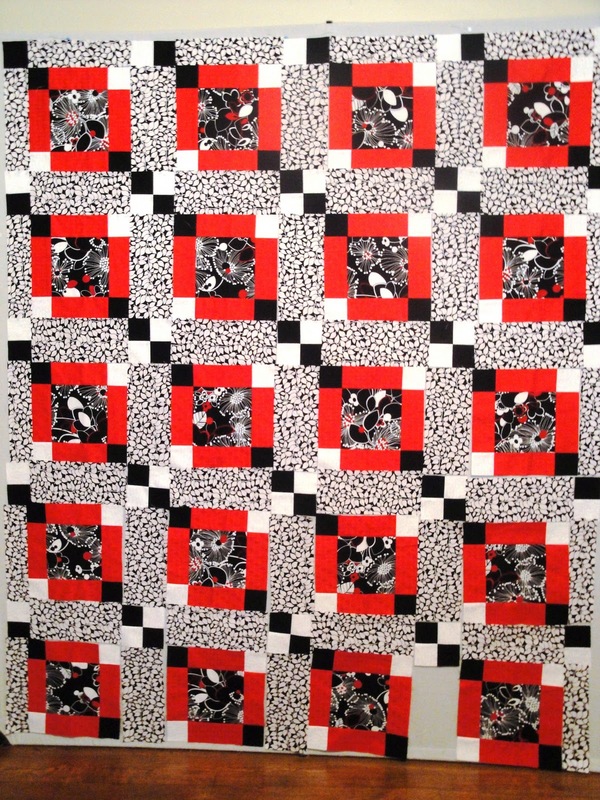 Be looking for her new fabric from Westminster, a vinyl-covered cotton. OMG it is great stuff. And who is that you say? 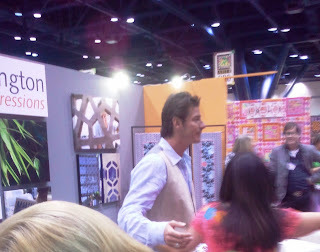 Yes, Ty Pennington of Extreme Makeover. He is in the home dec fabric business now. What a draw he was. This is as close as I could get to take a picture. They actually had a guard nearby (complete with gun). 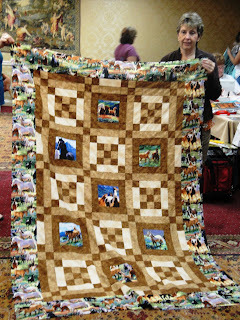 I guess you never know what a crazed quilter could be cabable of doing. It was just a fun few days. 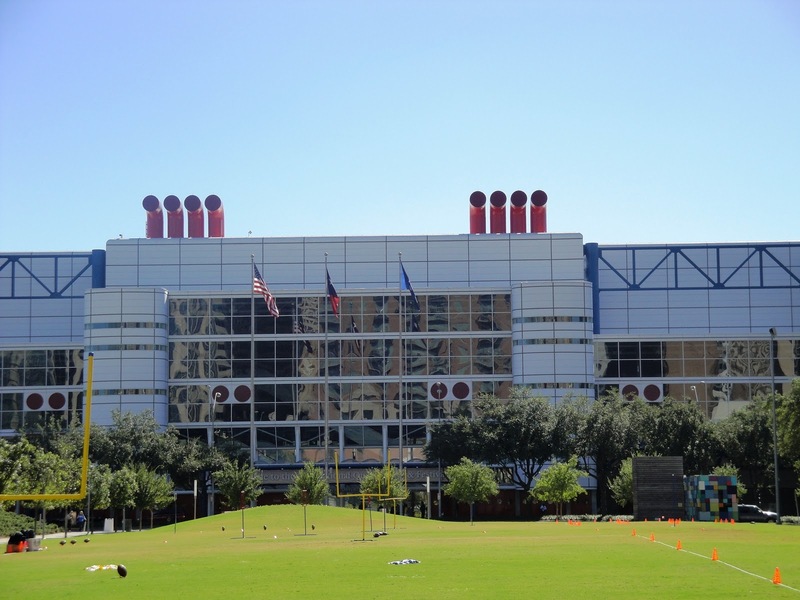 Yes, Houston we love ya. I took my neighbor and good friend out to lunch today for her birthday. And, when she got in the car she started laughing. Because this is what she saw. Me with my sun glasses on with one lens out. And, I didn't know it. I thought that my one eye (the one with the lens) must be dirty and that I would clean it when we got somewhere. Luckily I have many dark glasses in my car. Just think if she wasn't there to tell me. We were going to have her take a picture with my new phone before she left and forgot. So I had to take it myself when I got home. I wonder if it was like that yesterday at Ralph's Grocery Store? If it was, no one laughed. But, here is Dee at one of our favorite local spots, Cafe Ambosia. 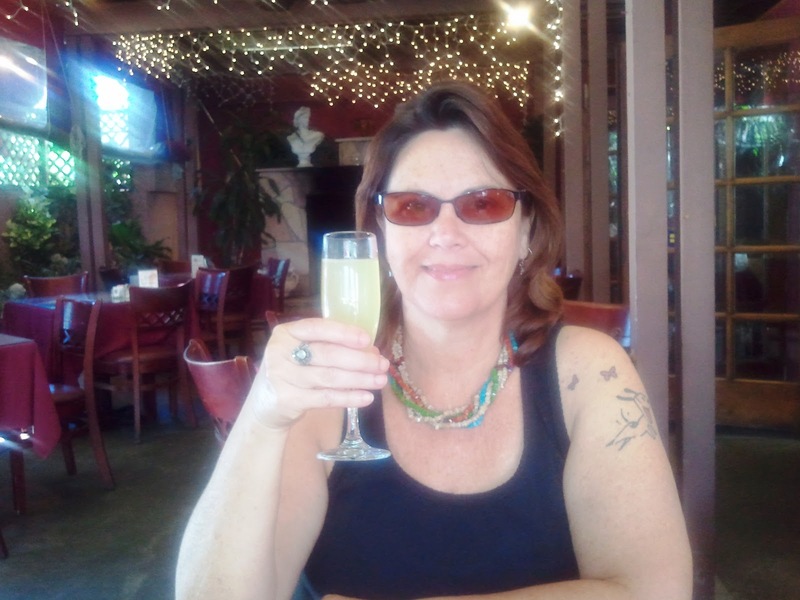 The mimosas were on special. Happy Birthday Dee. ﻿So, I think there is a moral to the story, always look in the mirror before you get too far. 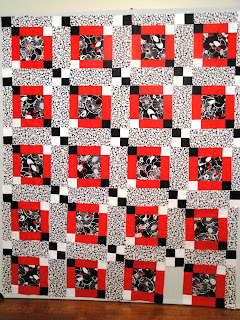 Remember the black & white & red fabric here? I pulled it out to work on today. 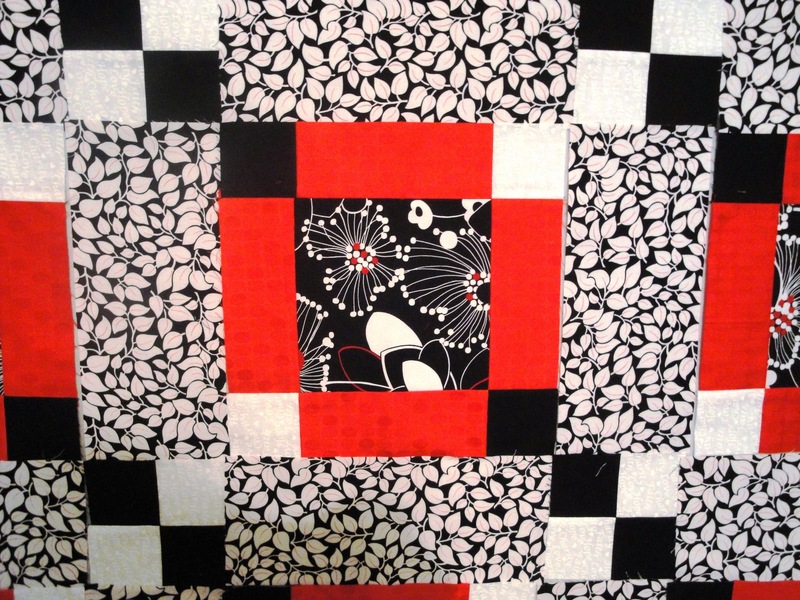 It is my favorite Robin Quilt's pattern to work on: East Meets West. I still need to cut another sashing piece (the right size, uh em). But, it is a good start. While I'm sewing I am watching one of my guilty-pleasure shows. Does anyone else watch Undercover Boss? I can pull the episodes off from On Demand with my FIOS provider. What a silly sap I am.....I actually cry at the end of every show. Every time. 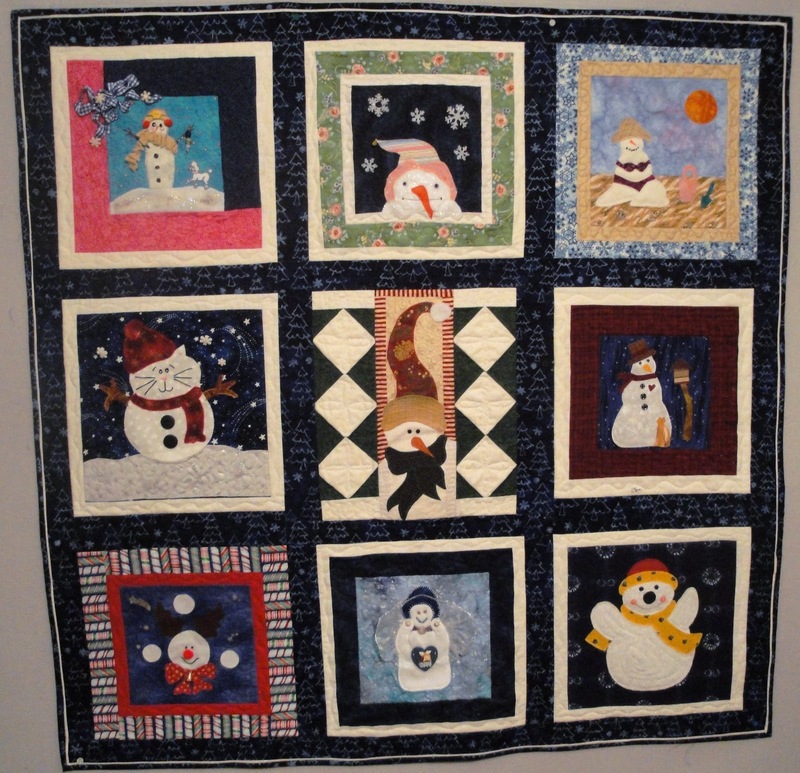 I finished my "Snowmen Friends" quilt today. 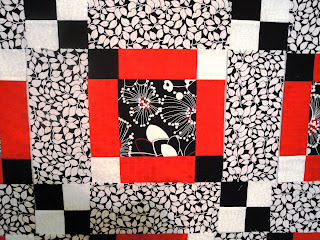 My friend Naomi had recently posted about a faux piped binding tutorial by TLC Stitches. I loved the technique and will use it again. 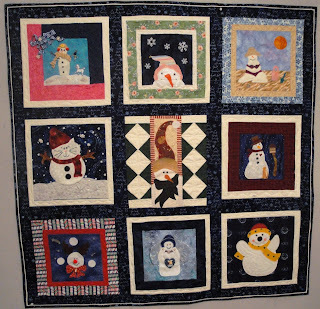 The Snowmen were from a block swap my friendship group did about six years ago. We were to make a snowman block any size and any way. This "anything goes" is not something to tell a group of women to do. 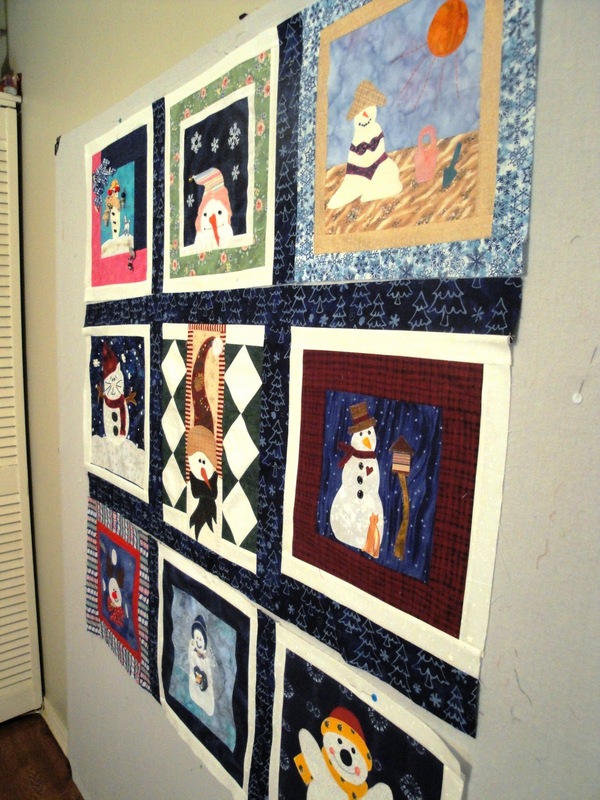 However, since we have no rules, there were blocks ranging in size from 15" square to 5 1/2" by 16". You get the picture. It took a bit of extra thought and fabric to put it together; but, that was the fun part. 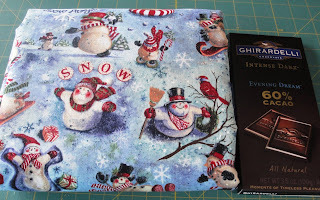 I am entering this into my Christmas in July challenge. 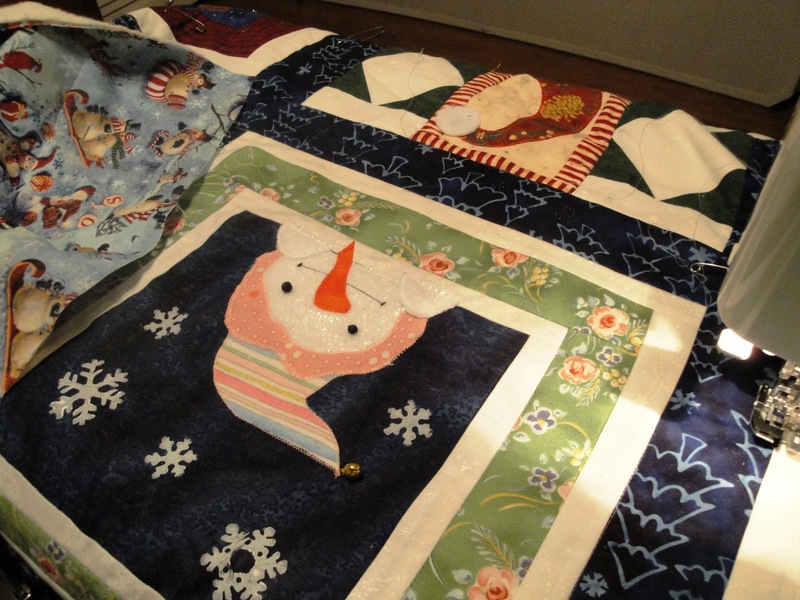 This month it can be anything Christmas out of fabric. I think this qualifies, don't you? I love your comments and if I don't respond to your comment, you are probably set to no reply. If that is the case, please leave me your email address. 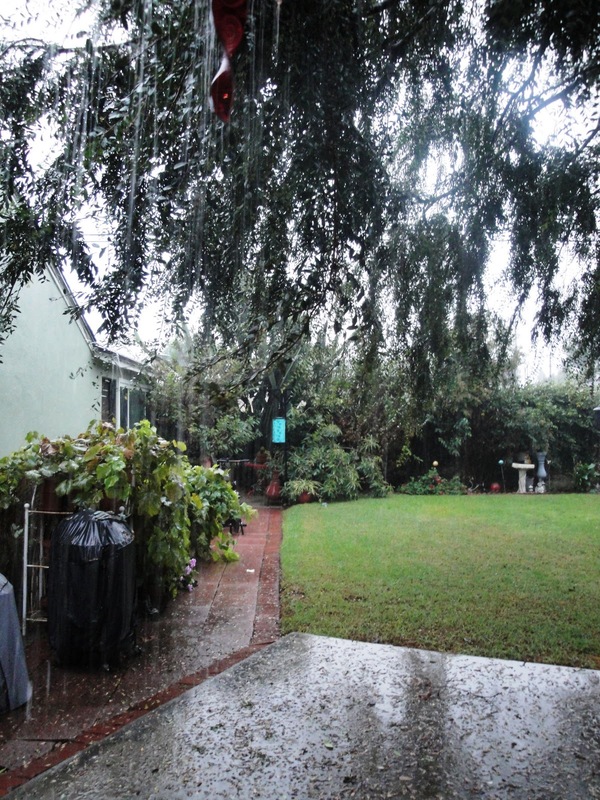 It's raining today. I could get a good book and lose myself in it; but, I think the best thing to do is quilt. 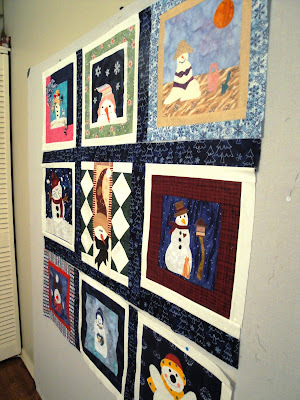 I am ready to quilt my snowmen top and realize that I really don't have a suitable backing and I need to go shopping. Not that anyone will see the back, but it should somewhat relate to the front. 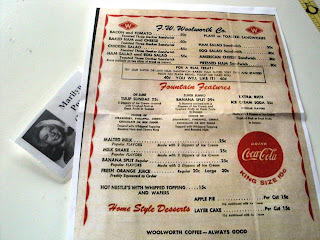 And look what I found. Pretty perfect don't you think? 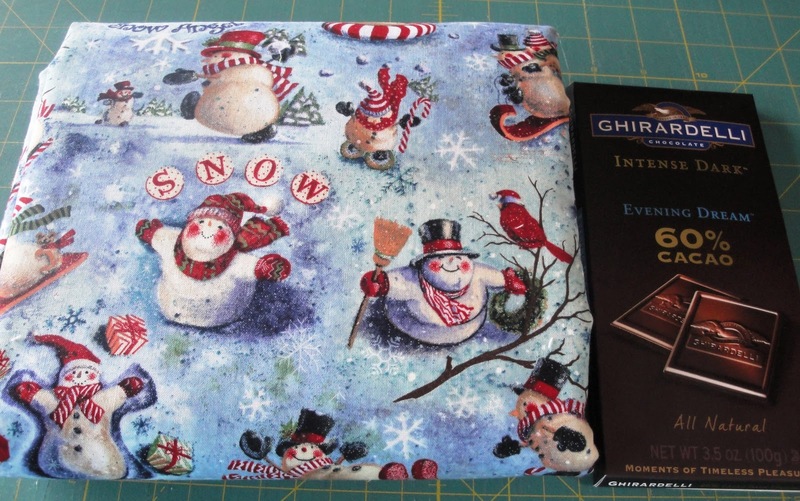 Oh, and the chocolate too. You need chocolate on such a gloomy day. So it is sandwiched now and I'm part-way through. Check back later. It shouldn't take long especially if it rains tomorrow. Just a peek of what I'm working on this week. I graduated from Roosevelt High School in Fresno, California at least 100 years ago. And, I just just got back from my high school reunion. It was rather disappointing in that there were only about 30 of us who made it. I'm sure there are many reasons for this and a large reason is no one could find each other. So, is does make one stop and realize that we need to work at keeping up with each other. 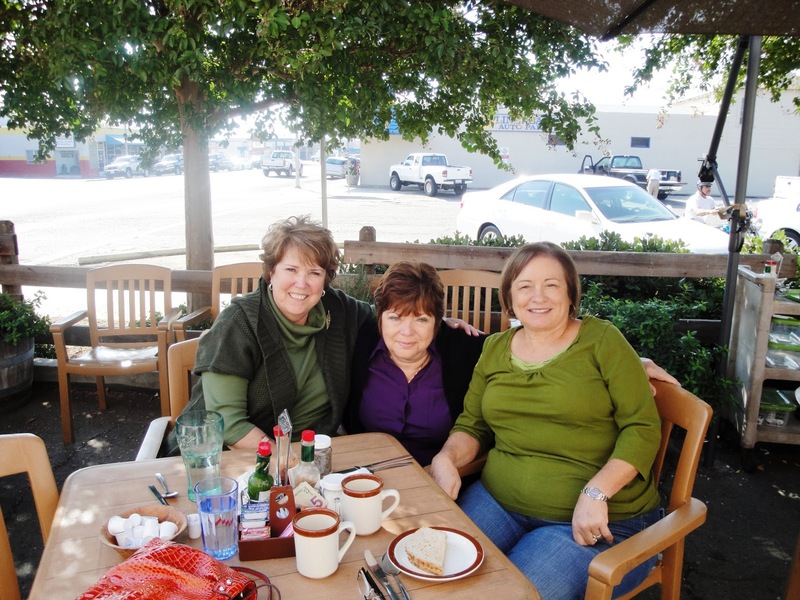 On my day to return to my life in Long Beach, three out of four best friends managed to meet for breakfast. We spent over two hours (clearly not enough time) visiting and doing some long-needed catching up on our lives. Vicki and Linda still live in the area. Our fourth best friend, Lanier, lives in Dixon and couldn't make the reunion. While at breakfast, we pulled out our calendars for next year (OK, I pulled out my cell phone) and we have scheduled a girl's weekend for August of 2011. Hope you can make it Lanier. We all wore name badges with our Senior pictures on them and some other memorabilia to make us feel old. 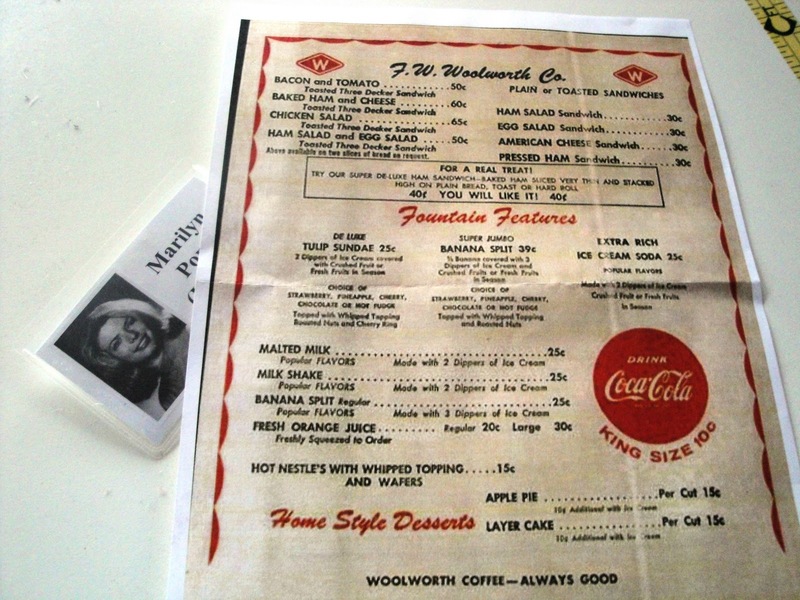 Check out these prices (just click on the photo). Told you it was over 100 years ago. I have had a busy week and it isn't letting up anytime soon. 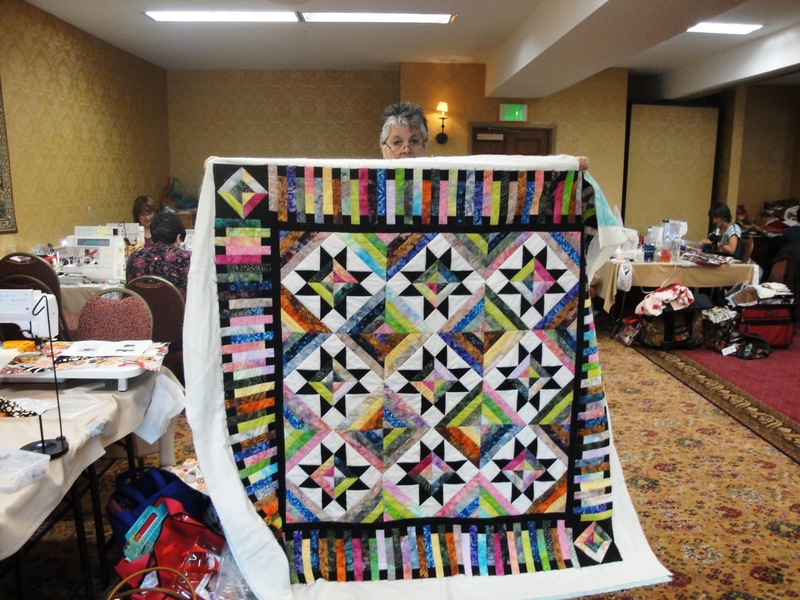 Last weekend, Robin and I hosted our Fall Two Wacky Women Quilting Retreat. Here is a small sampling of what went on. Judi finished this block swap while there. Carol machine quilted this gorgeous batik quilt at the retreat. Of course, there were many finishes and a lazy photographer. 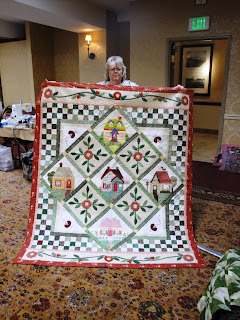 On Tuesday we drove to Big Bear Lake to vend at another quilt retreat with mostly members from the Victorville Quilt Guild. Sorry, no pictures. I forgot my camera. But, remember that new bag I recently made? Next one coming soon. 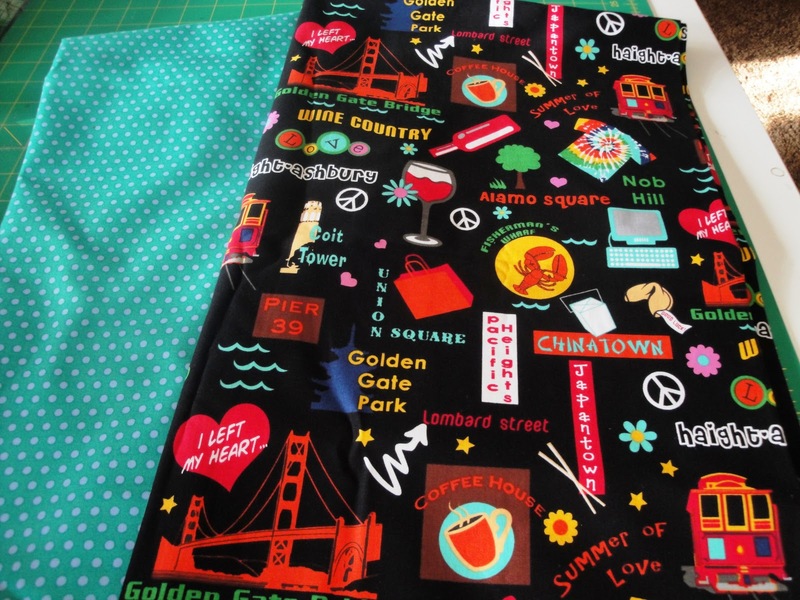 Isn't the San Francisco fabric just too cute?